A key event this week during the 2018 Physician Leadership Summit in Boston will honor the CPE credential. One of the significant moments of the 2018 AAPL Physician Leadership Summit will take place on Saturday, April 28. That’s when association leaders and Summit attendees gather to celebrate the 20th anniversary of one of health care’s most meaningful designations — the Certified Physician Executive. Since 1998, when the first “graduating class” of CPEs received their credentials, nearly 3,000 other physician leaders have followed suit. What: American Association for Physician Leadership’s 2018 Physician Leadership Summit. When: Thursday through Monday, April 26-30. Highlights: Spring Institute education sessions, celebration of CPE 20th anniversary, convocation to recognize seasoned CPE leaders, awarding of AAPL’s annual Leape Ahead and Roger Schenke awards, Beyond Burnout & Resilience workshop, Vanguard Program, peer presentations, Thought Leadership Symposium (includes discussions on opioids, physician engagement, women MDs and the physician leader value proposition, global health accreditation and population health). The CPE credential was the American Association for Physician Leadership’s answer to a rising industry call for formal certification of physician leaders. The association created a program that would recognize them for their leadership skills and accomplishments in health care, while also orienting them to the expectations of formal leadership roles. The Certified Physician Executive certification debuted in 1997, aimed at helping physicians achieve their personal and professional goals and maximize their leadership potential to influence health care. And after two decades, the CPE credential has become the benchmark designation for leaders who are best equipped to lead and drive sustainable change in an increasingly complex industry. CPE certification has helped open doors in today’s highly competitive job market as health care organizations increasingly bring physicians into the C-suite to provide the medical perspective that their business leaders just don’t have in this era of value-based care. While clinicians with leadership potential usually have thorough technical skills, and might even take leadership courses, moving into (and working within) the C-suite requires a different knowledge base. Many have difficulty making the transition. The CPE program provides the essential polish for physician leaders — ultimately giving credibility to their abilities, and making them more attractive to organizations and executive recruiters seeking accomplished and influential job candidates. Those were key factors in creating the certification, says Bob Hodge, MD, CPE, FAAPL, FACP, chairman of the board of directors of the Certifying Commission in Medical Management, a nonprofit organization chartered by AAPL to establish and maintain certification standards. Hodge has been an association member since 1978. Barbara Linney helped develop and administer the CPE program during her 22-year tenure with the American College of Physician Executives, the predecessor of the AAPL. Linney, who retired in 2012 as vice president of career development, calls CPE certification the public manifestation of a lifetime of professional experience that combines education with leadership. Hodge and Linney will be honored for their roles in creation and advancement of the CPE at an April 28 luncheon during the Summit, which runs April 26-30 in Boston. READ MORE: With the complexity and uncertainty around health care, it takes a special type of guidance to help the industry find its way. For two decades, CPEs have been at the forefront. 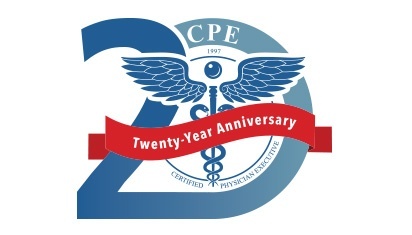 Check out “The CPE at 20: A Higher Level,” to learn about the origins of the credential, what it for physician leaders and what it means for the future of health care.